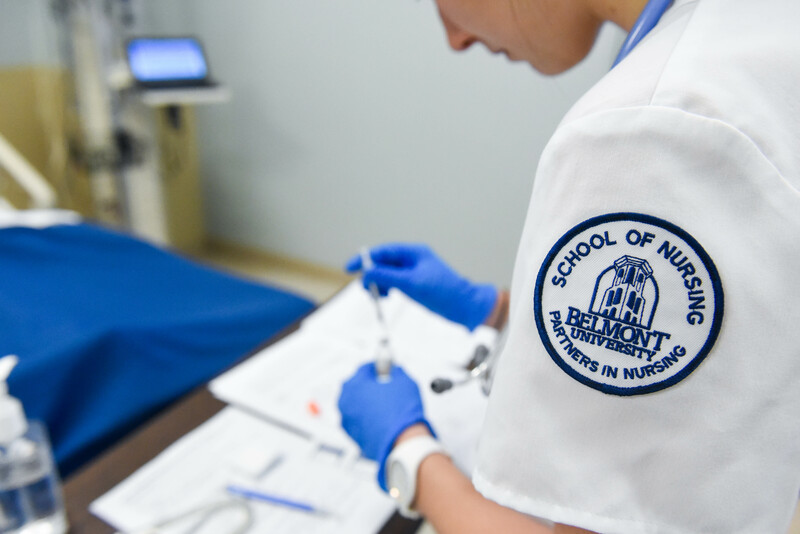 Students in Belmont’s School of Nursing are prepared for all aspects of what they’ll experience on the job – including caring for patients and their families at the end of life. The School’s curriculum is heavily based on experiential learning as students receive hands-on training in health care facilities and the University’s state-of-the-art simulation labs. For senior nursing students in Dr. Sara Camp’s Adult Health II course, one of the most memorable experiences they’ll see in these labs comes through the End of Life Simulation. Upon arrival, students were made aware of their patient, Ms. Lisa Moss’s, prognosis, as well as her signed Do Not Resuscitate (DNR) order. Prepared to provide appropriate end of life care for Moss, students entered her room and were greeted by a ‘family member,’ played by an actor, who stayed with them throughout the entirety of the simulation as their patient slowly passed away. Though having the opportunity to understand end of life care for the patients they will be working with is paramount to their success as nurses, Camp says the opportunity to understand the importance of caring for the entire family unit during these times of transition and loss is just as important. To ensure professionalism and the best experience for students, Camp and the School of Nursing hires actors from local theatre groups. Susie Monick, a local actoress, participated in this year’s End of Life Simulation for students. Above all, Monick said she was most impressed with the students’ concern for their patient and herself as she acted like a grieving daughter in her dying mother’s hospital room. Having experienced end of life care with her own family members and friends, she understands the importance of this training for upcoming nurses.